Since we’ve gotten a new puppy I’m trying to be especially good to the cats. It’s not that Carly doesn’t love the kitties, she does. It’s just a little too much love for Marla and JouJou. She tackles them and licks them. She tries to chew on their ears. She chases them around the house not realizing that while she loves being chased they don’t so much. Not about to hide under a bed like the Joujamonster has been for a few weeks now, Marla has been followed by Carly the lovesick puppy an awful lot. 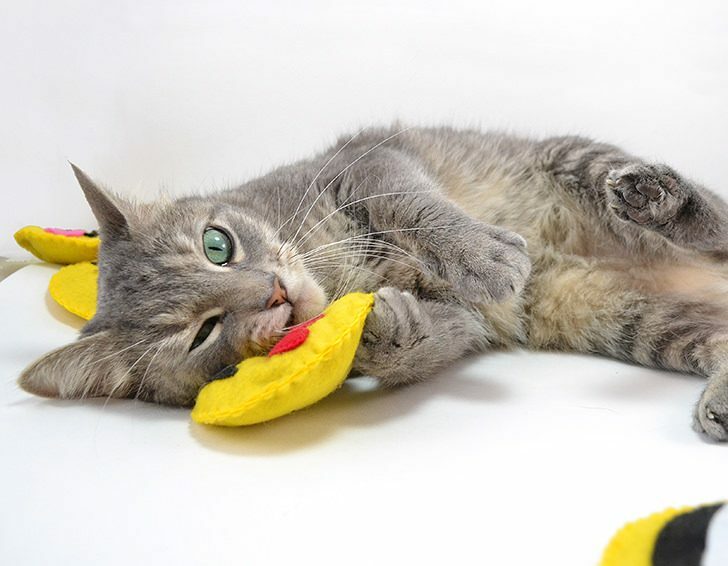 And in truth, Marla encourages her attention because she does like to play with her. But Lil Bit has got so much energy that she wears everyone clean out and sometimes Mar needs a breather. :) I’ve actually started putting a box of craft stuff in front of my office window so Mar can lay and not be bothered in at least one of her favorite spots! 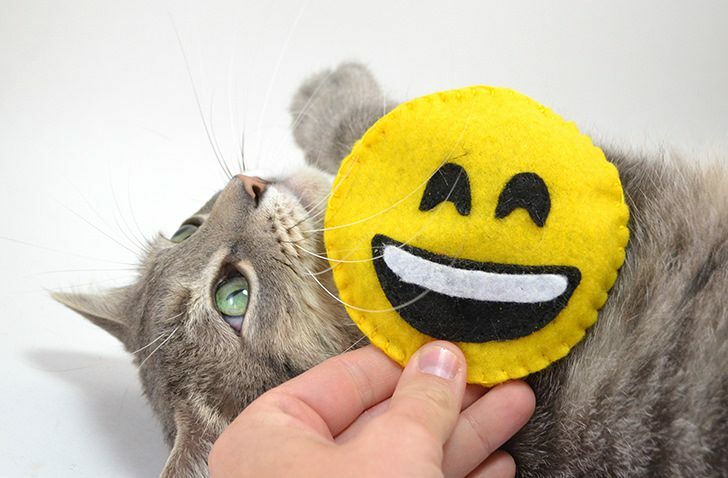 With Carly around the kitties most definitely need a little bit of TLC and so I decided to make them some happy toys. 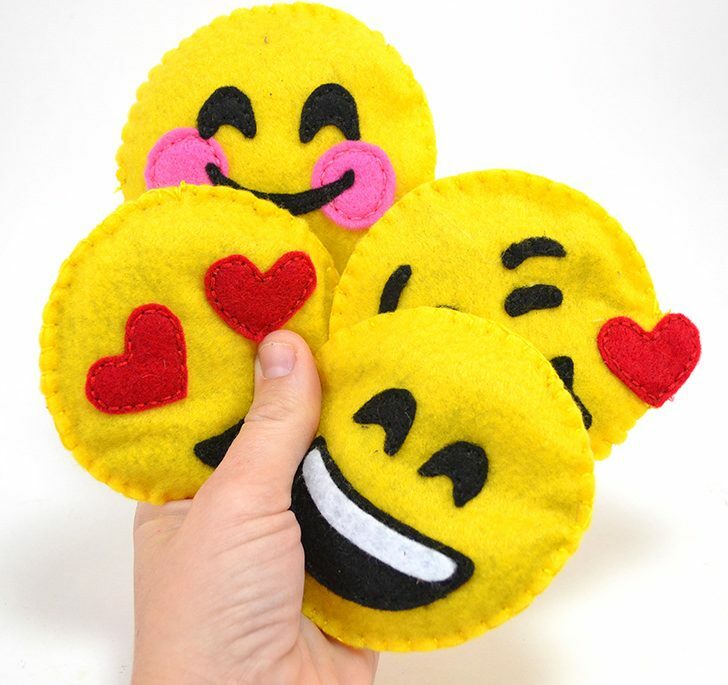 And what’s happier than emojis? Not much, right? I am sure I’ve said it before, but I’ll say it again… my cats totally dig handmade. 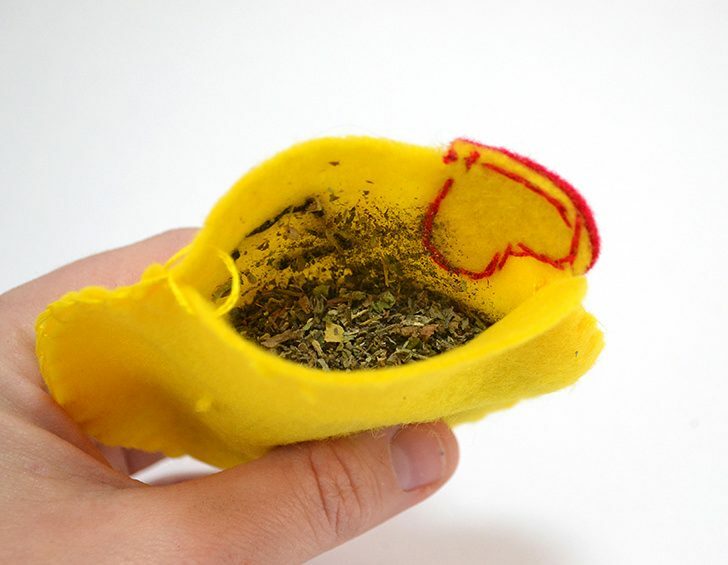 And since felt and floss and catnip are all super cheap this project might even be less expensive than buying storebought, anyway. In fact, if you’re crafty it’s quite possible that you already have everything on hand to knock this puppy out of the park. 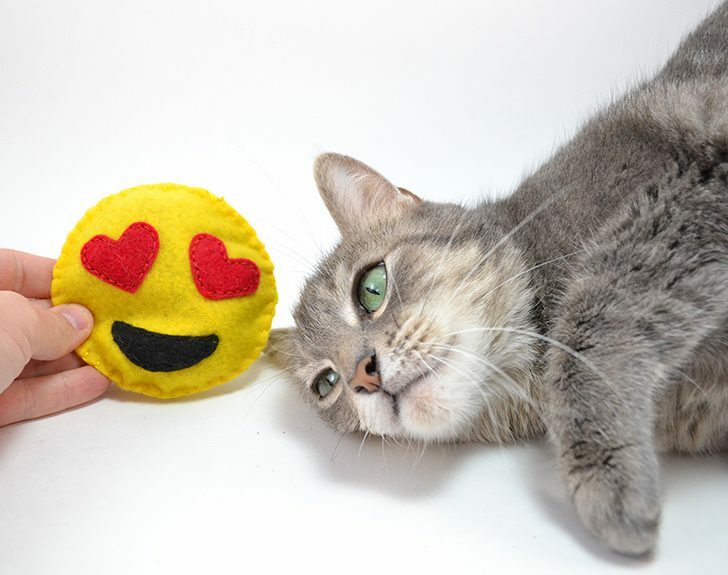 Want to make some super adorable emoji cat toys for your kitties? 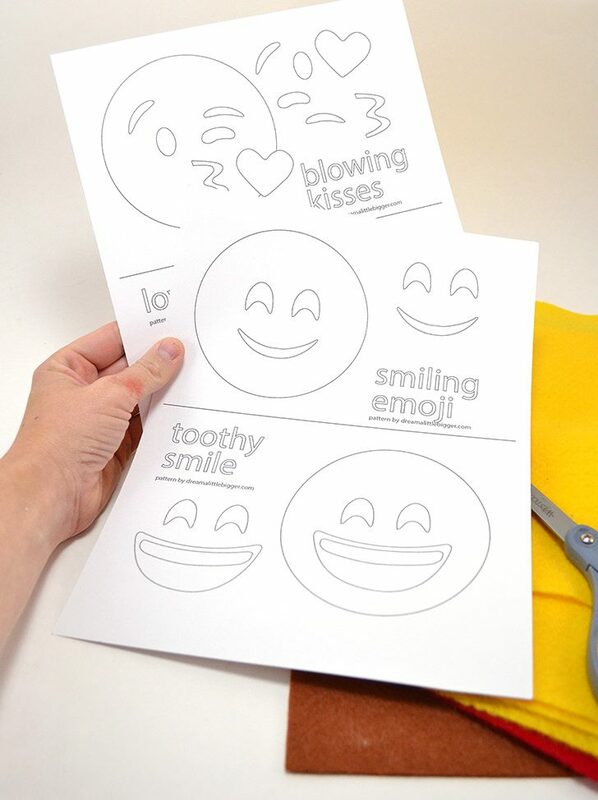 Print your free patterns on office paper or freezer paper. 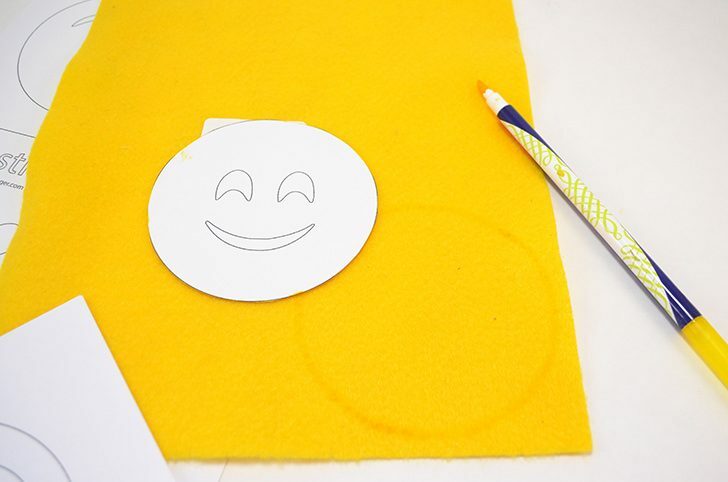 Cut the copy paper patterns out and trace or apply the freezer paper patterns with a hot iron (see more details on how to perfectly cut felt with freezer paper here). 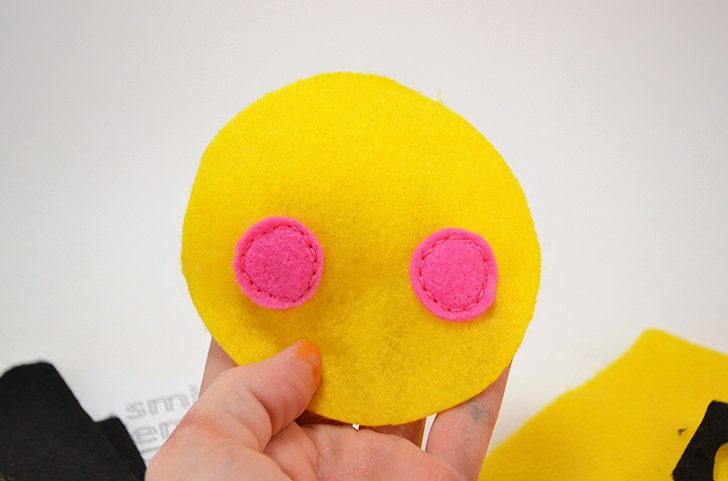 Stitch the pieces onto the felt large, yellow felt circles with matching floss. Use your patterns to help guide you with placement of each piece. 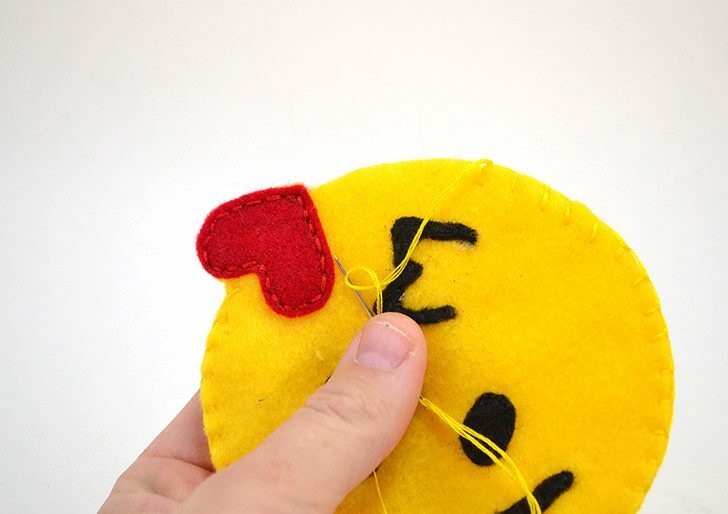 You can always use a smidge of glue if you’re having a difficult time keep your felt pieces in place while you stitch. 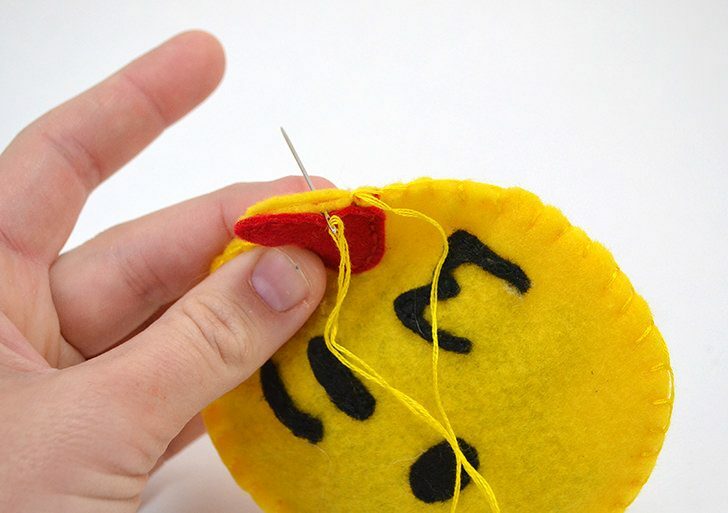 Just add a dab of glue to the center and it will stay perfectly in place! 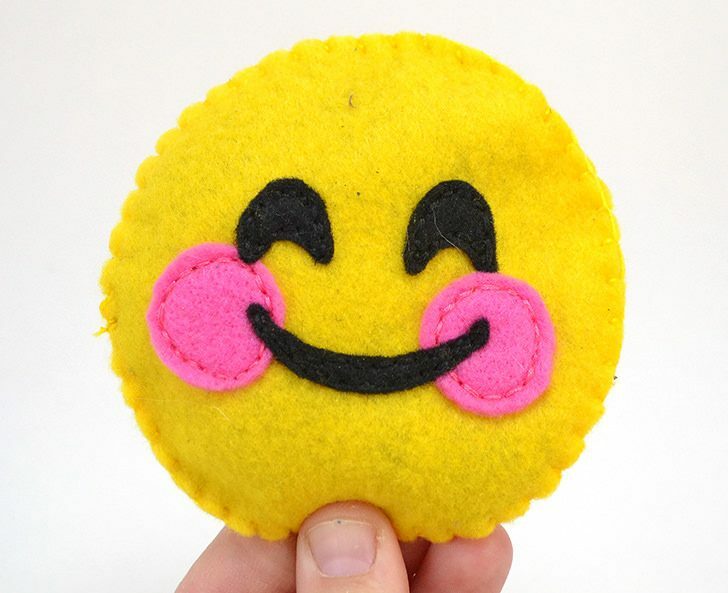 When a face is complete, using yellow embroidery floss, stitch the top circle to another yellow felt circle using the blanket stitch. Leave a gap of about 1-1.5 inches open. 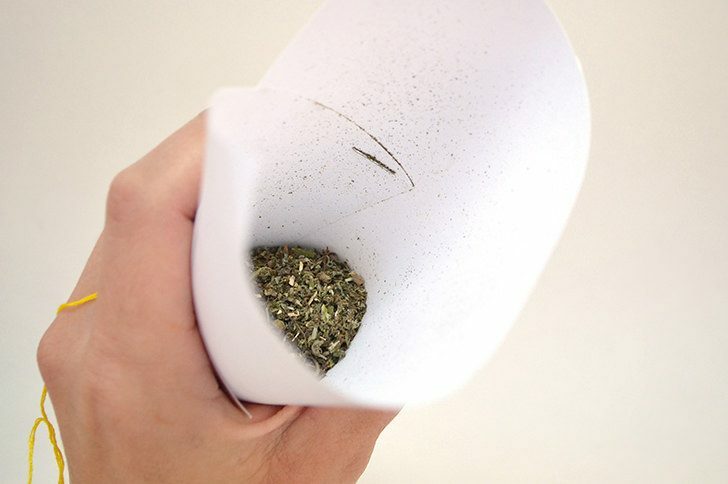 Using a piece of paper and tape or staples, create a funnel and transfer catnip into the inside of your emoji through the gap you left open. These are fairly large cat toys so each will take about 0.25 ounce to get a nice, even fill. 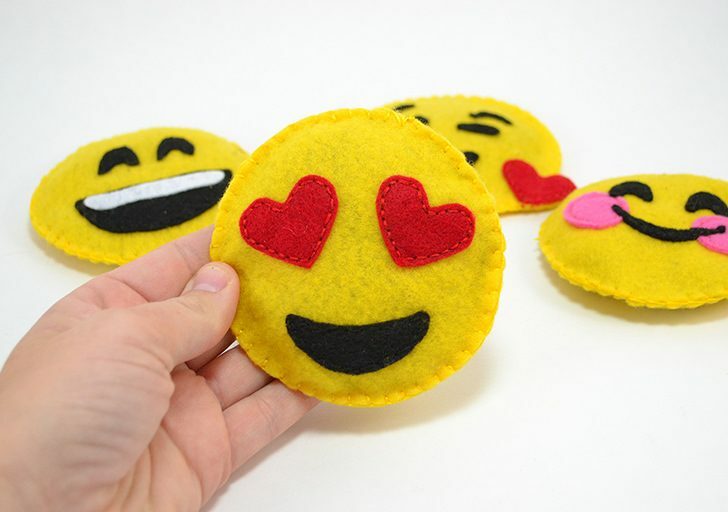 Finish the blanket stitch to close up your gap and these guys are done! And so stinkin’ cute, amIright? I think I love the heart ones the best but Marla seems to be a fan of them ALL! Yay! 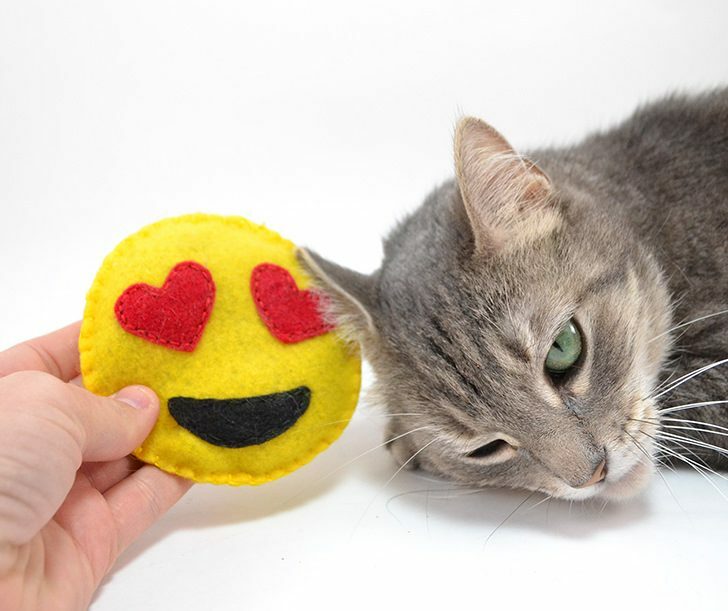 I LOVE making felt catnip toys because felt is so cheap that I have TONS of it. I can make them new toys whenever the feeling strikes because it’s so cheap. 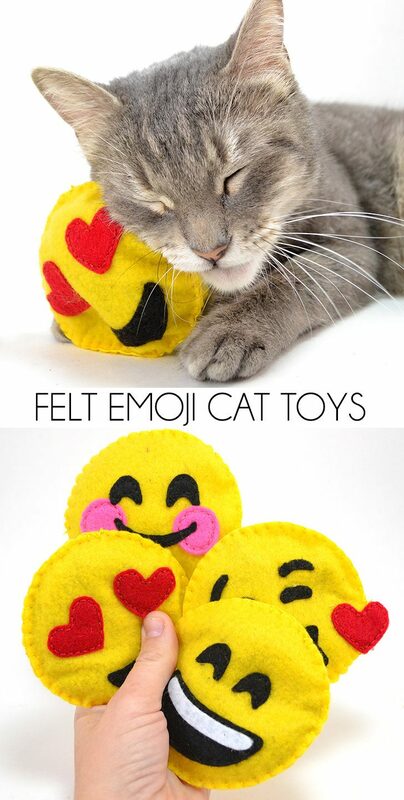 I hope kitties love their emojis!